I was out the door at 5:40 am headed toward the end of town where Historic Route 66 would take me to Interstate 40. My anxiety had to do with the fact that today would be my first day walking on the Interstate. 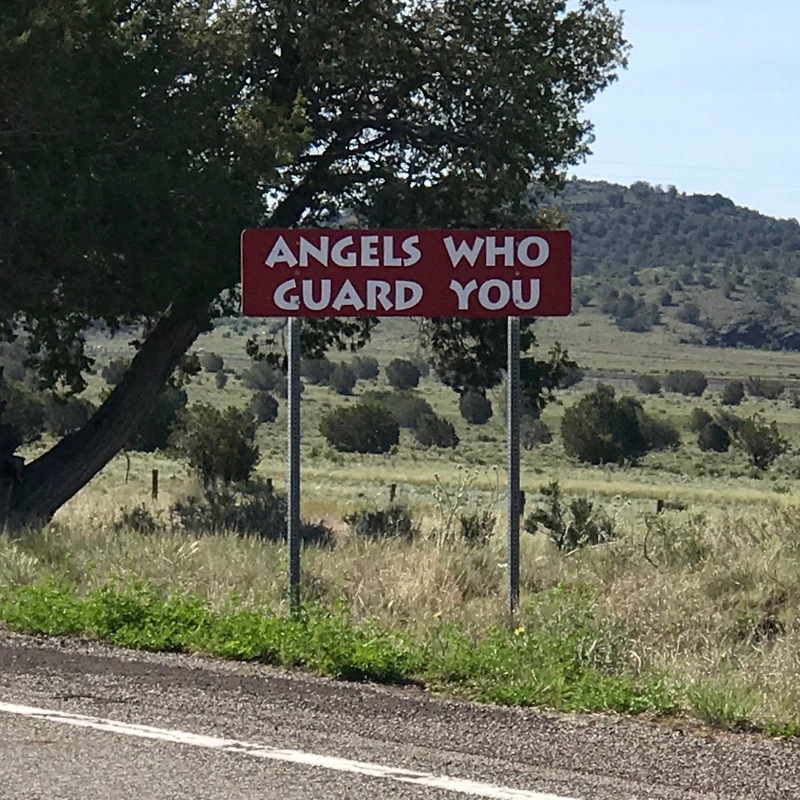 And frankly I was worried, even as I walked 18 miles on the most beautiful stretch of highway (Old Route 66) I’d experienced yet on this journey. One might say it was bucolic. I could hear many birds, there was little traffic, the trains were visible but not loud, and the hills rolled somewhat gently. I listened to a variety of jazz including Jim Hall’s wonderful recording of Concierto de Aranjuez, and could see I-40 in the distance. The cyclist’s name was Florian, he was German, and had ridden from Chicago on Route 66. We chatted in English and German for a few minutes (four years of German at Wantagh High School was not a complete waste of time), and promised to become Facebook friends. Then I hiked the next 6 miles on an 8-foot wide shoulder, ignoring the trucks and cars as best I could (I put in my ear plugs), and made great time getting to Ash Fork. I took the first Ash Fork exit so I could walk through yet another town that time (and I-40) forgot. Sure, there are a couple of gas stations at either end of town (near the exits), and it may indeed be the Flagstone Capital of the USA. But the empty storefronts and unoccupied houses (many of them charming) tell another story. The Copper State Motel is difficult to describe other than to say, “I’m back in the 1950s once again.” But it has a fridge, microwave, and internet, and is around the corner from a gas station convenience store and the Family Dollar. My legs are stiff from 25 miles today (a new record).